And the Trial of a Triangle has our hero making his return (probably before he disappears again...a flaw that The Librarians will have to address sooner or later). This ode to Lewis Carroll and the Alice books is a charmer and winner, which could have developed more if not for the time constraints. Flynn Carsen (Noah Wyle, who also wrote the episode) is captured while breaking into The Library. 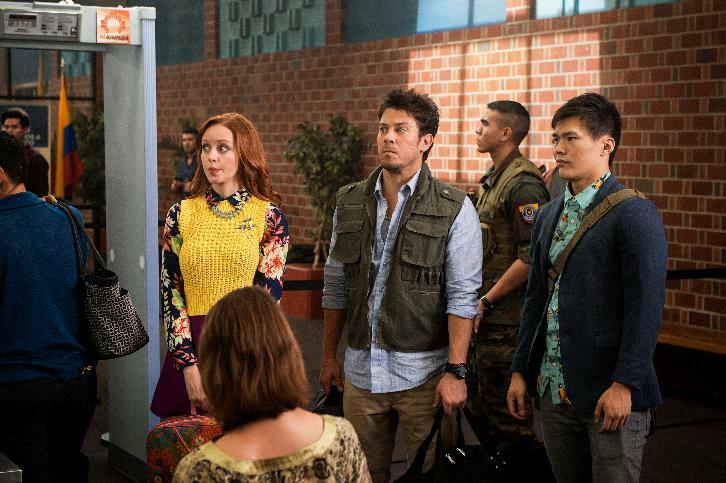 The other Librarians: Jacob Stone (Christian Kane), Cassandra Cillian (Lindy Booth), Ezekiel Jones (John Kim), along with Flynn's love interest/Guardian Eve Baird (Rebecca Romijn), all stage what they call an 'intervention' where they tell Flynn that he is descending into a personal abyss (though only Eve appears to take this intervention seriously). They do, however, communicate that in various ways, Flynn won't give the others their due. For his part, Flynn isn't that enthused to hear all this, since he has more important matters at hand. At the top of the list is The Eye of Ra, which according to him looks like '1970s disco bling' and is the vital piece needed to defeat Apep and bring Charlene back. The last known sighting of The Eye of Ra was during the tenure of Librarian Teddy Chislington (W. Morgan Sheppard), and it was lost at sea many years ago when he sailed in the HMS Tibbar. Actually, it was lost in the Bermuda Triangle. Thanks to a little detective work by Stone, he surmises that the Triangle is actually connected to The Walrus and the Carpenter, one of the most famous and verbally dexterous poems from Through the Looking Glass, the sequel to Alice's Adventures in Wonderland. The Clippings Book then points them to the next disappearance (as the Bermuda Triangle works in a pattern). Therefore, it's off to Venezuela and the plane fated to disappear there. It's here that Flynn and Eve stage a fight to distract the security from the others sneaking a device to transport them out of danger, a fight that seems eerily accurate about where they stand and how Flynn is. We can see that Flynn truly is in love with Eve when he declares to her, "I love you more than learning itself," words to melt any bibliophiles' heart. One thing they didn't count on was that there would be actual passengers aboard the flight, and now they face a dilemma: save themselves or save everyone even if it means losing the chance at the Eye. Despite what Flynn may say (even in his somewhat garbled Spanish), Flynn won't sacrifice innocents for an artifact and spirits everyone away by hypnotizing them into being pigs. He even hypnotizes the DOSA agent (Andrew Harris) that secretly tailed them. Flynn, however, goes his own way after everyone escapes to safety, opting to sacrifice himself for a chance at the Eye. He lands in a fantastical, Carroll-like world, where a Knight (John Larroquette), who could also be Don Quixote, starts him off to find the Eye, or see if he is worthy of it. As he meets various beings who look similar to his Librarians in Training, he finds that what they say about him is true, and he is forced to look at himself for all his flaws. Chislington appears, finding his successor worthy and bequeaths him the Eye, but with a warning that a life must be taken to use the Eye, a life of his choosing. He now finds his way back to the Library, where he actually incorporates the ideas of the other Librarians for the next steps, and even manages to send DOSA a message: their agent is sent back, still under hypnosis but now as a chicken. DOSA head Rockwell (Vanessa Williams in a cameo) is not amused, saying if that's how The Librarians want to play it, then it's war. A lot of my enjoyment of And the Trial of a Triangle is in the way things came together when it comes to incorporating the wild world of Lewis Carroll into the story. The way The Walrus and The Carpenter are the clue about the Bermuda Triangle down to the name of the first ship lost there (the Tibbar being the reverse of Rabbit) all show a wickedly clever script by Wyle. The fact that a action/fantasy show can quote C.S. Lewis and Lewis Carroll as part of the story shows that it trusts its audience to keep up. We also have very strong character development, particularly by Wyle's Flynn. And the Trial of a Triangle show his faults and virtues (his inability to take the other's thoughts as equal to his own, his willingness to sacrifice himself, his insecurities, his genuine kindness), and by the end of the episode, we do see that change (he suggests that Cassandra come up with what to do with the DOSA agent, and is willing to share a celebratory beer with Stone). He even makes his feelings for Eve clear, not just in that delightful "I love you more than learning itself", but in how he tells her he loved her from the first moment he accidentally ran into her in the premiere episode. The episode also gave the other castmembers a chance to play others, though with varying degrees of success. Seeing Larroquette in the fantasy scene made me wonder if he ever tried to play Don Quixote. Booth as what I figure is The Red Queen questioning Flynn in rhyme (how I enjoy a story where rhyme is part of it) speaks her lines so well, so elegantly. Pity that Kane, Kim, and Romijn in this section appeared almost as cameos themselves. We got that foreshadowing with the Eye of Ra, which means that we'll have to wonder whose life Flynn will take. If there were things in And the Trial of a Triangle that might have worked better, it would be in integrating the fantasy versions of Stone, Eve, and Jones better than it did. The fantasy Stone, for example, is a knight who threatens Flynn whenever he lies to the Red Queen. At one point, he raises his helmet to reveal it's Stone (or a version of him) and he winks at Flynn. Is it the real Stone? If now, why the wink? Still, And the Trial of a Triangle is a nice, delightful, well-acted, well-written Librarians episode, balancing the adventure/comedy/fantasy elements without one overwhelming the other.